The success of a restaurant often rests on the quality of its kitchen staff. The staff plays a key role in food preparation that ultimately determines one of the most important aspects of the dining experience — the food. According to the Bureau of Labor Statistics (BLS), job prospects in this field are expected to remain good from 2008 to 2018, despite slow growth in new jobs. High turnover rates can lead to exceptional opportunities. The chef is is ultimately responsible for the quality of the food. The chef oversees and participates in food preparation prior to the creation of the ultimate dish. 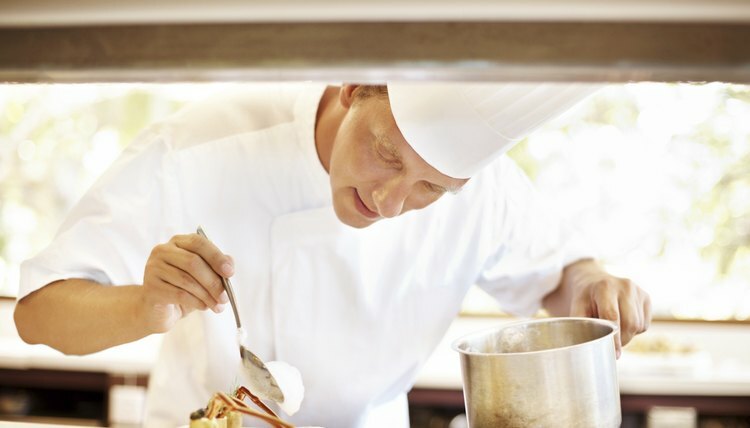 Head chefs may take a more active role in managing the kitchen by hiring and firing staff members, estimating costs and preparing food, ordering from vendors and overseeing the restaurant operation. The BLS notes that the head or executive chef may oversee several kitchens in establishments such as a hotel or corporate dining room. Second only to the head chef, the sous chef is the chef in charge of supervising the kitchen staff when the head or executive chef is not present. The duties of the sous chef are often similar to those of other key kitchen staff members. Sous chefs work with the other chefs preparing and cooking food. As the second in command, the sous chef watches out for problems that may arise in the kitchen and attempts to correct them. Because sous chefs supervise other kitchen staff, they also provide guidance, direction and discipline. The sous chef may also be responsible for planning menus and scheduling workers to fill shifts. These administrative duties can take up to one-fourth of the sous chef's time throughout the workday. Kitchen porters or food-preparation workers are responsible for many of the cleaning and general food preparation duties that help maintain an orderly and efficient kitchen. They wash pots and pans while keeping the food storage areas clean and orderly. They also clean food-preparation areas. These workers may also take the trash out of the kitchen, replenish supplies and remove leftovers and scraps from the food-preparation areas. They may also play a role in preparing food by peeling potatoes or performing other general food-preparation tasks. Career Planner: Job Tasks for: "Food Preparation Worker"
Lewis, Jared. "Kitchen Staff Duties & Responsibilities." , https://careertrend.com/list-7430794-kitchen-staff-duties-responsibilities.html. 27 December 2018.